Three weeks on, three weeks off – I think the beginning of Glee‘s season 3 was designed just to drive us gleeks crazy. But finally Glee came back this week, although it was with a bit more of a whisper than a shout. I thought “Pot O’ Gold” was a decent episode, but nothing remarkable, and definitely not what I was hoping for after three weeks of waiting. Nonetheless, there were some great moments from old faves like Burt and new faves like Rory, and I can’t deny how adorably fun both “Last Friday Night” and “Candyman” were. So let’s break the episode down a bit more, shall we? Favourite Character: Since I was a big fan of Damian McGinty on The Glee Project, it should come as no surprise that I totally loved Rory’s debut this week. His Irish brand of dorky cuteness was perfect, and I particularly loved his interactions with Finn. If Glee is planting the seeds for Rory to be the new male leader of New Directions after Finn graduates, they’re certainly starting it off well. Of course, I also adored Burt Hummel this week and can’t wait to see his campaign heat up against Sue. Favourite Song: I’ll admit it: I’m a sucker for Darren Criss singing Katy Perry songs. I thought that Blaine’s version of “Last Friday Night” was super cute, and it was so much fun to watch the kids party in the choir room. The Troubletones’ rendition of “Candyman” was also super excellent – but where did those three other back-up singers/dancers come from? Regardless, those three girls are super talented together, and The Troubletones is an awesome name. Brittany: You look magical and amazing, but I don’t understand what you’re saying. So, if you want to make it in this land, you really need to speak English. Brittany: Sour Patch Kids are just Gummi Bears that turn to drugs. Rory: Finn Hudson. I’ve seen you on YouTube, losing glee club Nationals after tongue-kissing your girlfriend for 10 minutes. I’m a big, big fan. Rory: I love everything about America, especially NASCAR, your half-black president and Victoria’s Secret catalogs. Favourite New Couple: Brittana is officially on, ladies and gentlemen! Sure Santana’s still not ready to go public with her relationship with Brittany, but that’s to be expected. I’m still super stoked that these two fantastic girls are finally making a go of it, and I can’t wait to see how things develop when they finally decide to let others know. 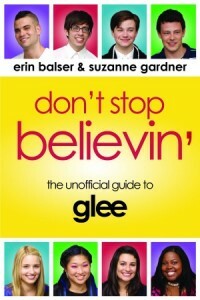 The word on the street is that episode 7, titled “I Kissed a Girl”, will center around Santana coming out to her parents. I. Can’t. Wait. Strangest yet Most Compelling Storyline: This Quinn/Puck/Shelby business is insane, yet I love it. It’s incredibly likely that I’m mostly just excited to have Quinn and Puck involved in interesting storylines again, but still. Seeing Quinn be so damn determined to get something, even if it’s something as ridiculous as the baby she gave up for adoption, is fantastic. And poor Puck, torn between doing the right thing and helping the girl he once loved. It’s super soap opera-esque, but deliciously so. Of course, I could see a Puck/Shelby romance coming from a mile away, but admittedly I wasn’t expecting a kiss to happen right at the end. Holy complicated drama, Batman. Weak Point: Has anyone in either New Directions or The Troubletones done any math lately? Glee clubs need 12 members to compete at Sectionals, and right now ND is sitting at ten and The Troubletones are at four (unless those back-up girls are actual members of the group, then they’re at seven). It seems almost inevitable that the two groups are going to have to join forces at some point if they want to compete. And then, of course, there will be the requisite drama at Sectionals because two opposing groups will have to become one…it all seems a bit too cliché to me. And speaking of clichés, I’m getting a bit tired of the repetitive storyline of Figgins shutting down the glee club/school musical/any arts program. I’m with you Suzie, where the heck did those Troubletones back-up dancers come from?? Lol. I’m on the same page as far as the episode went, wasn’t that impressed. But I simply adored Damian’s debut (he’s a Glee Project fave of mine too), and I thought Burt running against Sue was just awesome. If only for that string of dialogue up in the headline. Can’t wait for next week! I hear episode 5 is a great one. Thanks for the comment, Tanya! I know Glee is notorious for having back-up bands pop out of nowhere, but back-up singers/dancers is a new one!